The National Theatre presents a major new production of William Shakespeare’s celebrated play about the destructive power of jealousy. 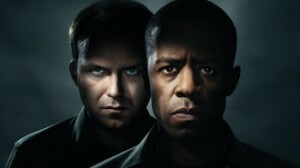 Olivier Award-winning actor Adrian Lester takes the title role. Playing opposite him as the duplicitous Iago is fellow Olivier Award-winner Rory Kinnear, who is reunited with director Nicholas Hytner. Othello, newly married to Desdemona – who is half his age – is appointed leader of a major military operation. Iago, passed over for promotion by Othello in favour of the young Cassio, persuades Othello that Cassio and Desdemona are having an affair. This is an ‘Encore’ recorded screening of the National Theatre Live event. It will be shown in Movies @ Swords on 26th September and will be of interest to our 5th year students who will be studying ‘Othello’ for Leaving Certificate in 2015.